Rinse and drain the butter beans then place in a large pan with lots of water, bring to the boil and simmer for 1 hour until tender. Drain and set aside. Cut the chorizo sausages into thin slices. Add the chorizo and cook until lightly browned then add the onion and continue to cook until it has softened. Add the vermouth and cook until it has reduced to almost nothing. 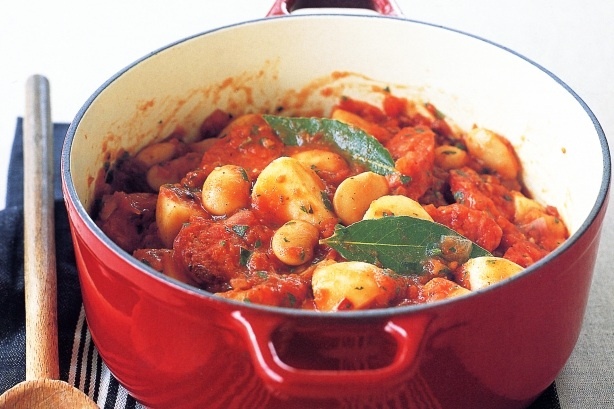 Add the canned chopped tomatoes, thyme, butter beans and 1/2 a teaspoon of salt and simmer for 15 minutes. Scatter over the parsley, spoon the stew into deep warmed bowls and serve with some crusty fresh bread.